1918 Ipswich Suffolk Chronicle & Mercury newspaper. Born: 1898, Bury St. Edmunds, Suffolk. 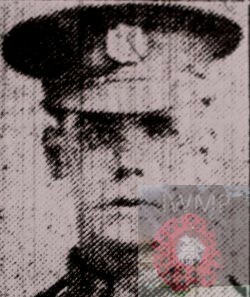 Died: 14th October 1918; age 20; KiA. Regiment: Royal Irish Rifles, 1st Battalion. Formerly 260107, Royal Warwickshire Regiment. 1901 53, St. Andrew’s Street, Bury St. Edmunds, Suffolk. Alfred was 2 years old and living with his parents & siblings. John Harrold, 45, a carpenter – Foundry, born Bury St. Edmunds. Annie Harrold (nee Kent), 44, born Bangalore, India. Annie Harrold, 19, born Bury St. Edmunds. Florence Harrold, 14, a Shop Assistant, born Bury St. Edmunds. Amelia Harrold, 10, born Bury St. Edmunds. John Thomas Harrold, 6, born Bury St. Edmunds. 1911 53, Stanley Avenue, Ipswich. Alfred was 12 years old and living with his parents & siblings. John, 55, a Carpenter – own account. Daisy Harrold, 27, a Packer – Confectioners, born Bury St. Edmunds. Nellie, 20, a Packer – Confectioners. John, 17, a Tuner – Lawn Mower Works. Alfred’s father, John Harrold, died 1913, Suffolk. His mother, Annie Harrold, died 1917, Ipswich.